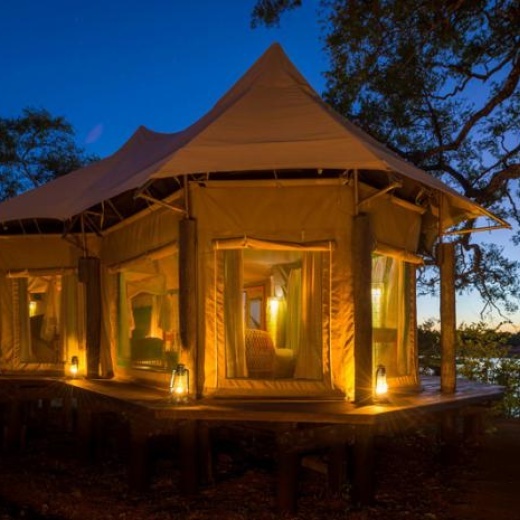 With stripped wooden floors, four-poster beds, cosy sitting rooms, en suite bathrooms and vaulted canvas ceilings, Chindeni's spacious tents are so inviting you could be forgiven for never wanting to leave your room. Especially when you can see so much wildlife just by stepping onto your own private deck jutting out over the lagoon. Two of the tents have twin beds (queen-sized beds), while the other two each have a king bed. Chindeni is open from May to December. Avid game viewers and birdwatchers can set out on superb walking safaris, game drives, night drives and scenic sundowner trips in the surrounding area. Or you can just park yourself in a deckchair at camp and watch the abundance of game that is drawn to the lagoon. Gaze out from your private veranda onto the lagoon which attracts birds and animals from miles around. Or settle back with a gin-and-tonic in the central lounge and dining area, a glorious expanse of varnished decking arranged on several levels around the surrounding ebony trees, boasting, of course, the same spectacular view of the serene lagoon and its inhabitants.